Long, but well worth your time. The Rev. Rienk Bouke Kuiper was of Dutch descent and grew up in the Christian Reformed Church. As Professor of Systematic Theology [1929-30], he was among the founding faculty at Westminster Theological Seminary, served as President of Calvin College in Grand Rapids from 1930-33, and thereafter returned to Westminster to teach Practical Theology, 1933-52. In his final post, he returned again to Grand Rapids to serve as President of Calvin Theological Seminary, 1953-56. 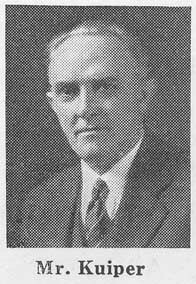 R. B. KUIPER, M.A., B.D. Few men who lay claim to Christianity deny outright the authority of the Bible. Even the so-called advanced modernist hardly does that. Eventually the logic of the modernist’s position must drive him to the rejection of all external authority. Present-day liberalism is deeply indebted to Hegel. It is hardly an exaggeration to call him its philosophical father. But Hegelianism is thoroughly pantheistic. Did not Hegel style the human will a Wirkungsform of the divine will and boldly declare, “What I do, God does”? Modernism too is pantheistic. It reduces the difference between Christ’s Divinity and man’s to one of degree only. It gloats over the divinity of man. Recently a liberal minister preached on The Other Me, who turned out to be none other than God. But, obviously, thoroughgoing pantheism leaves no room for external authority. If I am God, I will majestically decline to take orders from another. If I am God, I am my own authority. If, on the other hand, I am merely a finite human being, it behooves me to give heed to the voice of the Infinite. And if I am not merely finite but also sinful, so sinful in fact, that I cannot possibly save myself from sin and its consequences, it emphatically behooves me to obey the orders which God gives me in the Bible for my salvation. Let us say that you are bathing in the surf at Atlantic City. Imagine President Roosevelt in bathing near you. I do not suppose that he swims in public places, but let us assume for the sake of argument that he is there. He gets caught in the undertow and is being carried away. You notice his perilous plight, run for a life-saver and throw it out to him, all the while, of course, holding the attached rope in your hands, Now what do you say to Mr. Roosevelt? Do you address him thus: “My dear Mr. President, I observe that you find yourself in a sorry plight indeed; you are in imminent peril of finding a watery grave. Now your lowly servant has determined to put forth a concerted effort to prevent so great a calamity. May he not humbly beseech your honor to condescend to lay hold on the circular object which he is casting in your direction, in order that he may have the unusual honor of rescuing your esteemed person”? Or will you simply shout at him: “Hey there, grab that life-saver”? Of course you will do the latter. And I assure you that the President will not resent your language. Listen! If the President of the greatest republic on the face of the globe will not think of objecting if you, an ordinary citizen, issue orders to him in an effort to save him from drowning, would it not be the height of folly, folly beyond compare, if you and I, puny human beings that we are, should refuse to recognize the authority of the King of kings and Lord of lords, with whom all the nations of earth are as a drop of a bucket or the small dust of the balance, yea less than nothing and vanity, when he commands us what we are to do in order that we may be saved from everlasting perdition? But, as I have said, very few men, if any, who would be known as Christians deny the authority of the Bible outright today. Many there are, however, who compromise it. Compromise looks so much less wicked and also less perilous than denial. As a matter of fact it is fraught with even greater danger. There are at least two ways of destroying a house. One method is to carry several sticks of dynamite into the basement and to blow up the whole thing in a moment. That is a quick and effective way. Another way is to break the house down, one brick or one board at a time, or if one should begin at the roof, for a long time just one shingle a day. This is a far slower method, but in the end it proves equally effective. And it undeniably has one great advantage over the other method. It is much less shocking to the sensibilities of the occupants of the house, and for that reason one has a much better chance of getting away with it. If I should catch a man carrying dynamite into my home, I should lose no lime calling the police. If I should see a man breaking an occasional shingle from the roof, I should wonder and I might object, but I should hardly think it worth while to fly into a frenzy. The great deceiver is clever. He does not try to smash the Bible at one blow with an axe; he prefers to cut it up little by little with a penknife. This is so much less shocking to those who love the book, and therefore the danger of interference is so much smaller and the likelihood of success so much greater. I shall call attention to several ways in which men, evidently under the influence of the deceiver, are compromising the authority of the Bible. I. Men compromise the authority of the Bible by setting up another authority alongside it; in other words, by denying the sole authority of the Bible. The Roman Catholic Church has been doing this for centuries already. It speaks of two infallibles: the Bible and the Church. It claims to have not only an infallible Bible, but also an infallible interpretation of the Bible by the Church. Now if Rome went no farther than to assert that it has an infallible interpretation of the Bible, we Protestants would surely have to differ because we know of no ground for this belief, but a few of us might regard this view somewhat sympathetically. Who of us in moments of indolence has not wished for an infallible interpretation of Scripture? How much arduous exegetical labor would be spared us students and ministers if we had within easy reach an infallible interpretation of God’s Word! Again, how much theological strife this would obviate! And debating is hard work. However, Rome does not stop at this claim. It proceeds to add to the Bible many traditions. Even thus the worst has not been said. Several of these traditions contradict the teaching of Scripture. Belief in the immaculate conception of Mary, for instance, can hardly be reconciled with the biblical doctrine of the universality of sin. And the invention of purgatory simply does not square with the scriptural teaching that the soul on departing from the body goes at once to its eternal destination. So tradition is actually placed above the Bible. The mystics of the Christian Church, too, have set up another authority alongside the Bible. In their case it is not the Church, but what is designated by that fine-sounding phrase, the Christian consciousness. Nor have the mystics been satisfied to place the Christian consciousness on a par with the Bible. Fact is that many of them have exalted it above the inscripturated Word. They think more of the inner light than of objective revelation. The mystic is a good deal like a man receiving a telegram, glancing at it, and casting it aside with the remark, “I have a radio set of my own.” It does not seem to occur to him that the telegram may contain a message which does not come over the radio at all. As a matter of fact, does not the Bible tell us many things of which the Christian consciousness apart from the Bible knows nothing? What knowledge has the Christian consciousness by itself of the origin of the universe and the fact of Christ’s bodily resurrection? Precisely none, of course. For our knowledge of those and the other historical events which constitute the very foundation of Christianity we arc dependent altogether on the Bible. In the case of both the Roman Catholic and the mystic it is extremely interesting to compare their conclusion with their premise. Both start out by placing; another authority alongside the Bible. Both end up by exalting the other authority above the Bible. It lies, on the one hand, in the irresistible force of sound logic. Is it not self-evident that one cannot possibly honor two authorities as supreme? The expression two supreme* is a contradiction in terms. Every attempt to set up two ultimate authorities is bound to fail. It must of necessity result either in the deposition of both or in the deposition of one by its subjection to the other. You will recall that the ancient Greeks and Romans in their mythologies ascribed limitations and imperfections to the gods. Give them credit for their logic. This peculiar theology was the inevitable consequence of their polytheism. By all the rules of logic there can be but one absolute, but one infinite, but one supreme. So the force of logic accounts for it that the Roman Catholic and the mystic have found it impossible to maintain two supreme authorities. It must be added that the corrupt nature of man will go a long way toward accounting for the fact that, when they had to subject one to the other, both made the wrong choice. Instead of subjecting the Church and the Christian consciousness to the Bible they did the opposite. Will you pardon a rather trite illustration and a story? The Word of God teaches clearly and emphatically that the husband is the head of his wife. But nowadays there is a strong tendency to place the two on a par. Brides are no longer as willing as they used to be to promise obedience to bridegrooms. It is often said that the mother has as much right to be the head of the family as has the father. Let me assure you that when you hear married couples speak in this vein there is something wrong. If each is the head of the family, neither is. or, what is much more likely, the wrong one is. To place another authority alongside the Bible constitutes a denial of the Bible’s supreme authority and is pretty sure to issue in the subjection of the Bible to this other authority. II. Men compromise the authority of the Bible by ascribing authority to certain parts of it only; in other words, by denying the inclusive authority of the Bible. It obviously makes a world of difference whether one grants that the Word of God is in the Bible or holds that the Bible is the Word of God. A man has a piece of metallic substance in his hand- Whether it has gold in it or is gold may make a difference of several hundreds of dollars. In the former case as little as one percentage of it may be gold, in the latter it is a gold nugget. So to say that the Word of God is in the Bible may mean next to nothing. It goes without saying that due allowance must be made for textual criticism. But if, this done, it be maintained that not everything in the Bible is the authoritative Word of God, the question arises what is? There are those who insist that only the New Testament, not the Old, is the Word of God. They find not a fuller revelation of the one true God in the New Testament, but a God who differs radically from the Jehovah of the Old. But the absurdity of this view is self-evident. As Bishop Wordsworth has pointed out in his valuable work on the Canon, the New Testament canonizes the Old. Does not the New Testament say, for instance, with reference to the Old that “the Scripture cannot be broken”? Others tell us that only the words of the Lord Jesus in the New Testament constitute the Word of God. This view quite ignores the promise given by Christ to the disciples that the Holy Spirit would load them into the truth. It also suggests the question—call it naive if you will—how we may know that the words of the Lord Jesus are correctly recorded in the gospel according to John, let us say, if John did not write infallibly. If only Jesus was infallible, do we have his words? Surely, if we are not sure of having Jesus’ infallible words, their infallibility boots us little. May I remark here that personally I do not like the idea of certain publishers of the Bible to print the Savior’s words in red. This device is apt to leave a wrong impression with the reader. There is danger, t take it, that he will regard Jesus’ words as the Word of God in a fuller and more real sense than the words of the apostles and prophets, which is not the case if the whole Bible is the Word of God. Not long ago a modernist preacher told me in conversation that to his mind the teaching of Jesus was just about right. His only objection was that Jesus took bell a little too seriously. Apart from that minor criticism he was prepared to put the stamp of his approval on the words of the great teacher. Was it not the liberal Harnack who after much study came to the conclusion that the part of Jesus’ teaching which is commonly called the Sermon on the Mount constitutes the Word of God? Not even Karl Barth, the stalwart German opponent of liberal theology, will grant unqualifiedly that the Bible is the Word of God. He teaches in effect that it is the source of the Word of God and that it actually is the Word of God for me only when God speaks to my heart through it. Modernist and mediating ministers like to say nowadays that the Bible comes to us with supreme authority in spiritual matters only, and that its references to history and science may be, and in certain cases likely are, quite faulty. That position is taken, for instance, by the well known Pearl Buck, until recently a missionary of the Presbyterian Church in the U. S. A. She is said to have made the hold declaration that, even if it should be proved that Jesus never existed as a historical character, this would have little, if any, bearing on the continuance of Christianity, since the spirit of Christ would go marching on just the same. Has it occurred to you how flatly she contradicted the chief of the apostles? Wrote Paul in First Corinthians fifteen: “If Christ hath not been raised, then is our preaching vain; your faith also is vain; ye are yet in your sins; they also that are fallen asleep in Christ have perished.” Evidently it was Paul’s firm conviction that Christianity is a religion of fact, that the structure of Christianity rests upon historical events, and if this foundation were destroyed, that the whole edifice would topple into ruins like a house of cards. If Paul was right—and we Christians are convinced that he was—then to deny the authority of the Bible in matters of history is to deny its authority altogether. That brings us to our last remark under this head. I have already indicated that to compromise the authority of the Bible by setting up another authority alongside it leads to the denial of biblical authority. Now I must add that to compromise the authority of the Bible by ascribing authority to certain portions of it only, leads inevitably to the same conclusion. How obvious! If it be assumed that not everything in the Bible is the Word of God, who is going to decide which parts of the Bible are the Word of God and which are not? But one answer is possible. Man will have to do the choosing. Every individual, I suppose, will have to decide for himself. But thus man is elevated to the position of arbiter. He now stands in judgment over the Bible. And that is another way of saying that the Bible is no longer his authoritative judge. There is a good story of an army in flight, with the enemy in hot pursuit. The foe never ceased firing, and one man after another in the defeated army was shot down. Finally, however, a safe retreat was reached. Only, when the fleeing army arrived at this retreat not a single soldier remained. Much the same thing will happen to the Bible of him who permits the enemies of God to deprive him of one page today on the ground that it is not God’s Word and of another tomorrow on the same ground. When, after a while, he thinks that finally he has come down to the very Word of God in the Bible, he will make the disconcerting discovery that his Bible consists of nothing but two covers and a back. To say that not the whole Bible is the Word of God is to deny that the Bible is God’s Word. III. Men compromise the authority of the Bible by modifying the nature of its authority; in other words, by denying its sovereign authority. The orthodox Christian asserts that the Bible is the very Word of the living God and therefore comes to men with divine, sovereign, authority. But many there are today who assure us that the Bible has the authority of an expert only. The ancient Greeks were expert in art and literature. The old Romans were expert in war and law. So, we are told, the Hebrews were expert in religion. For some reason or other, perhaps because of their exceptional mental acumen, the Hebrews, it is said, had a remarkably deep insight into the things of the spirit and an amazingly advanced conception of the supreme being. For example, it dawned on them sooner than on any other people that God is one. Monotheism is their great contribution to the progress of the human race. Some of the most religious of these religious Hebrews recorded their thoughts and experiences in writing. These writings were collected in the book known as the Old Testament. It was Schleiermacher who said that the New Testament is the record of the religious experiences of the early Christians, and he added that the experiences of one of them did not necessarily harmonize with those of another. With reference to the Bible there is no more basic question confronting us than this one: Is it the record of man’s groping for God and, as many like to say, of man’s discovery of God; or is it the record of God’s revelation of himself to man ? In the former case it is the word of man to man about God; in the latter case it is the Word of God about himself to man. If the latter is true, the Bible comes with sovereign authority; if the former is true, it has at best the authority of an expert. The essential difference between Christianity and other religions can pointedly be stated thus: In all other religions man is feeling after God; in Christianity alone God comes to man, speaks to man, tells man who he, God, is. Every once in a while one reads the statement that the Bible is not a book but a library. How misleading! A library is a collection of books by different authors, as a rule. A book is most often the work of one author. The Bible has many human authors, to be sure; but it has only one primary author, God the Holy Spirit. The Bible is emphatically a book. It is the only book in all the world with perfect unity. Let us seek to discover to what conclusion the tenet leads that the Bible has the authority of an expert only. We shall assume that I am involved in serious problems of a financial or economic nature. As I am planning my trip from Philadelphia to Boston, where I am to attend this convention of the League of Evangelical Students, it occurs to me that the train will take me through Hartford, Connecticut, the city of that great authority on economics, Irving Fisher. I decide to stop over for an hour of consultation with him about my difficulties. Well and good. The prospect of receiving expert advice eases my mind. I am feeling fine. Having purchased a magazine at the station, I board my train. I nestle down in my seat and begin to read. My attention is drawn to an article on that perennial subject, the depression. Something is said about the fact that few of our leading economists saw the collapse approaching. A statement is made to the effect that even Irving Fisher of Yale a comparatively short time before the crash of 1929 predicted continued prosperity. I am shocked. My worries return. So not even the opinions of Irving Fisher, the famous expert, are fool-proof. What reason have I to suppose that his advice to me will prove sound? One thing is certain, it will not be infallible. If the Bible has the authority of an expert only, it is not infallible. It may well err on many points. Its authority is far from ultimate. We have considered three ways in which men compromise the authority of the Bible, and in each instance we have seen that compromise is in principle denial. The question is not whether we shall perhaps after a little have to be satisfied with half a Bible, but whether we shall have any Bible at all. The question is not whether we may possibly have to sacrifice part of our patrimony, but whether we shall be reduced to direst poverty. The question is not whether we may have to lose our baggage in a storm at sea, hut whether we shall have to go down, passengers and crew, into a watery grave. The question is not whether our sun may suffer a partial eclipse, but whether we shall be plunged into Stygian darkness forever. Which will we do: honor the Bible unqualifiedly as the Word of God or reject it? Which will we have: Christianity or paganism?